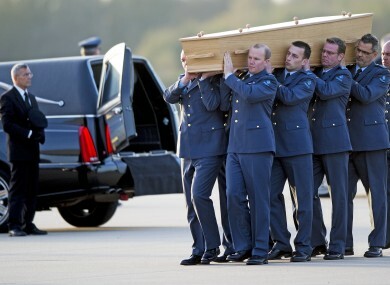 Remains of victims of the Mh17 flight are repatriated to the Netherlands. ANY SUSPECTS IN the downing of Malaysia Airlines flight 17 over Ukraine in 2014 will be prosecuted in the Netherlands, the Dutch government has said. Foreign Minister Bert Koenders said in a statement that the decision was made by the countries jointly investigating the crash, Australia, Belgium, Malaysia, Ukraine and the Netherlands. The statement says the countries will continue to cooperate on the prosecution and that it will cover all 298 victims, who came from 17 countries. Most were Dutch citizens. An international criminal probe concluded last year that the missile that destroyed the passenger jet was fired from rebel-controlled territory by a mobile launcher trucked in from Russia. Russia has denied any involvement and denounced the conclusions as politically biased. The Dutch Foreign Ministry did not identify eventual suspects to prosecute. Investigators last year said they had pinpointed 100 people they want to speak to who are believed to have been involved in transporting the Buk missile launcher or its use. Russia did not immediately respond to today’s announcement. The Russian government could refuse to extradite any of its citizens for eventual questioning or prosecution. Malaysia had proposed setting up an international court to try those responsible for the plane’s destruction, but Russia vetoed a UN Security Council resolution in favour of a tribunal. The Boeing 777, flying from Amsterdam to Kuala Lumpur, Malaysia, was blown out of the sky on 17 July, 2014, in eastern Ukraine amid fierce fighting between Russia-backed separatists and Ukrainian troops. The Joint Investigation Team, led by prosecutors and police from the Netherlands, made its preliminary findings public after interviewing more than 200 witnesses, listening to 150,000 intercepted phone calls, examining half a million photos and video recordings, consulting radar and satellite images, and sifting through dozens of containers filled with wreckage from the jet. The Russian military has said data from radar in southern Russia showed that the missile that downed Flight 17 did not originate in rebel-controlled territory. Email “Netherlands vows to prosecute anyone suspected of shooting down Malaysia Airlines flight ”. Feedback on “Netherlands vows to prosecute anyone suspected of shooting down Malaysia Airlines flight ”.